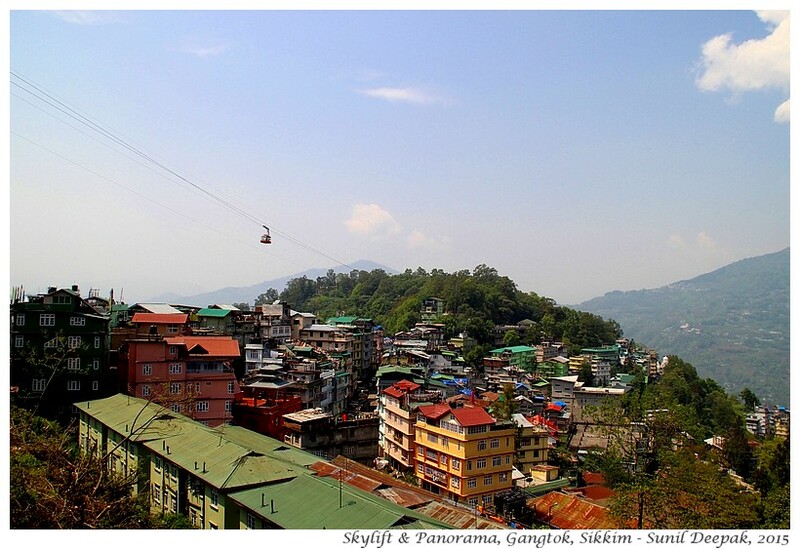 Tourists to Gangtok see only the city centre and the ridge. Apart from the crowds on the M.G. road and in the markets like Lal Bazar, you hardly see any tourists walking around in Gangtok. Most tourists go around in organized trips to visit places outside the city. 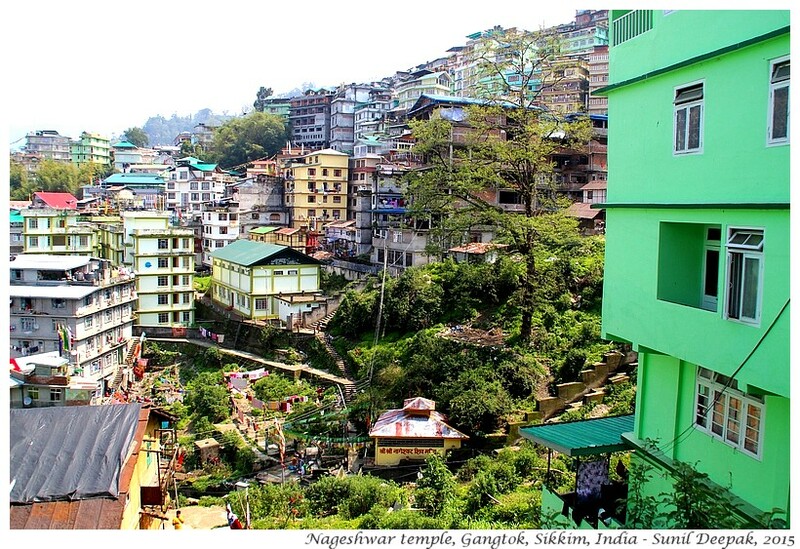 However if you like walking up and down on hill-roads going up and down, you can discover a different view of the Gangtok town. This post is about the places to see on the Pani House road, which is the main road connecting Gangtok to Siliguri, Kalimpong, Darjeeling and Rangpo. 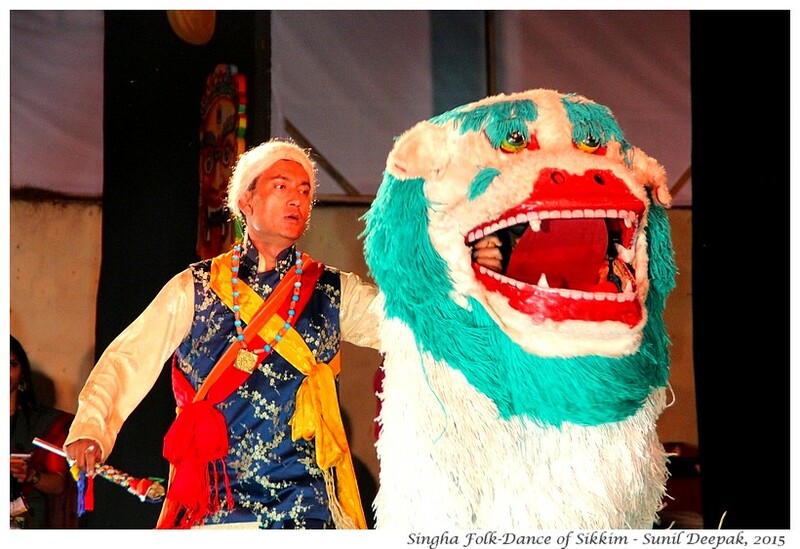 As you travel to Gangtok you will pass all the places described in this post. In an earlier post, I had written about a walking tour from M.G. road to the top of the ridge which has the old palace of the Chogyal and some other well-known tourist places of Gangtok. Compared to that post, the places described in this post are not so well known among the tourists. 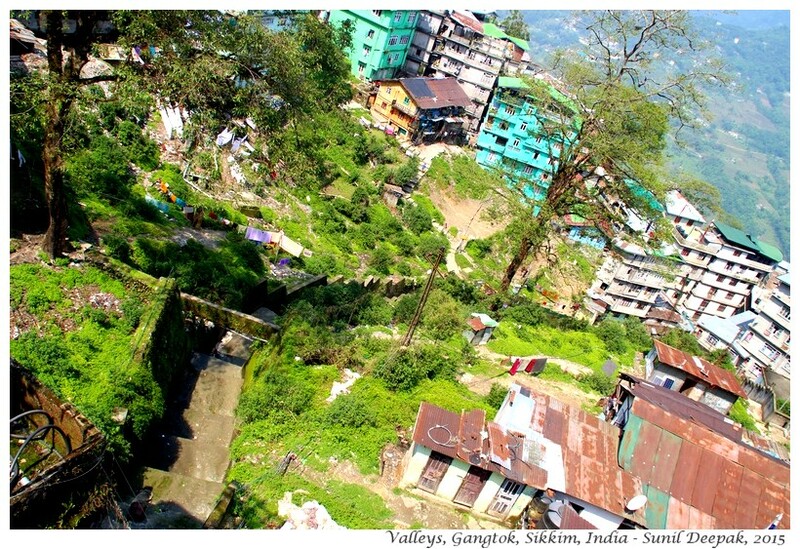 With its valleys and hills, Gangtok is full of “short-cuts”, which usually means going up or down some stairs. However, climbing the stairs for the short-cuts is hard work. 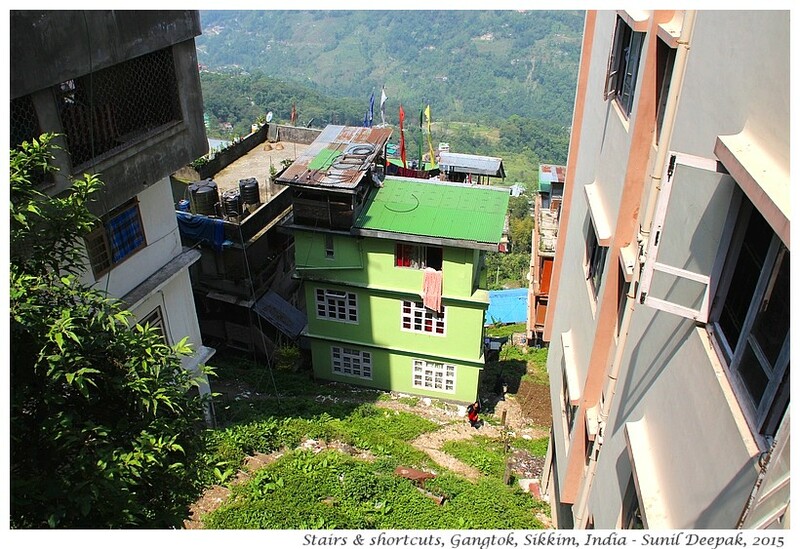 If you do not mind the hard work, I suggest that you try going up and down some stairs to understand the toils of daily life of ordinary persons in Gangtok. It will also provide you with beautiful and unusual panoramas of the city below you. For example, it was during going up and down the stairs that I realised about the love of people of Gangtok for the flowers. 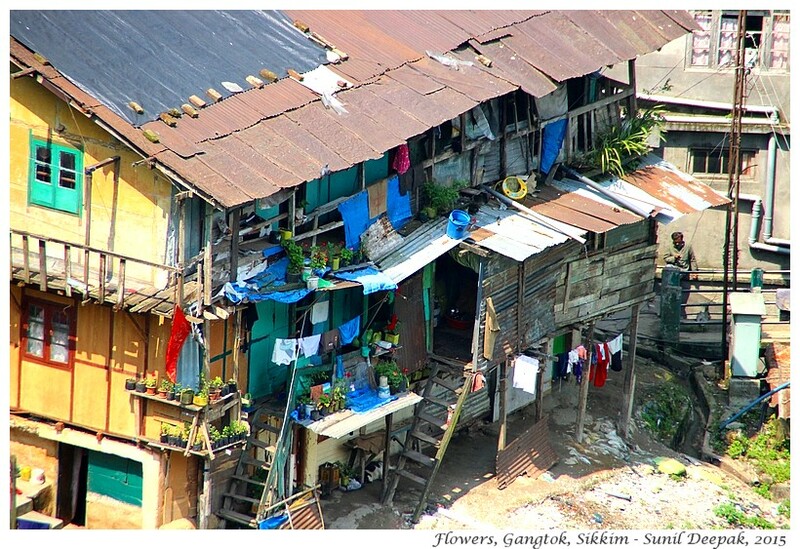 Even in the houses of poor persons, there were always some flower pots. One of the thrilling stair-climbing experiences that I had in Gangtok was from a place called Zero Point down to the Development area. I had gone to visit the centre of Sikkim Viklang Sahayata Samiti at Zero Point and I had to go to the Spastic society office in the valley behind it. Someone had suggested that I could just go down the stairs and walk instead of taking a taxi. I really loved this walk down the stairs, passing in front of homes and gardens. It was a long walk and fortunately for me, going down. I do not think that I could have done it coming up! Starting point of this walk is the Supermarket on Pani House road just across Lal Bazar market in the Gangtok city centre. Walk on the right side of the road where you can look at the valley below on your right. 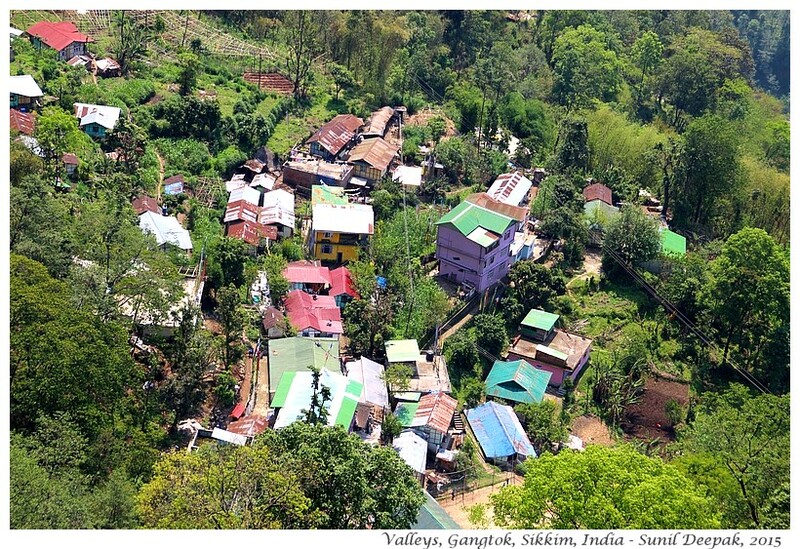 You can see the green valley dotted with houses, women standing out near the water-tap waiting to fill their buckets, with colourful lines of clothes drying outside the houses. At the bottom of this hill there is a small temple dedicated to Shiva called the Nageshwar temple. A simple temple, it seems to be very popular with the locals, who tell stories about the snakes in this area. Follow the road as it twists and turns going downhill. The footpath here is frequently interrupted by a few steps so it is not accessible to wheel chairs. A short walk later, on the left side you will see the Siddheshwar Shiva temple. 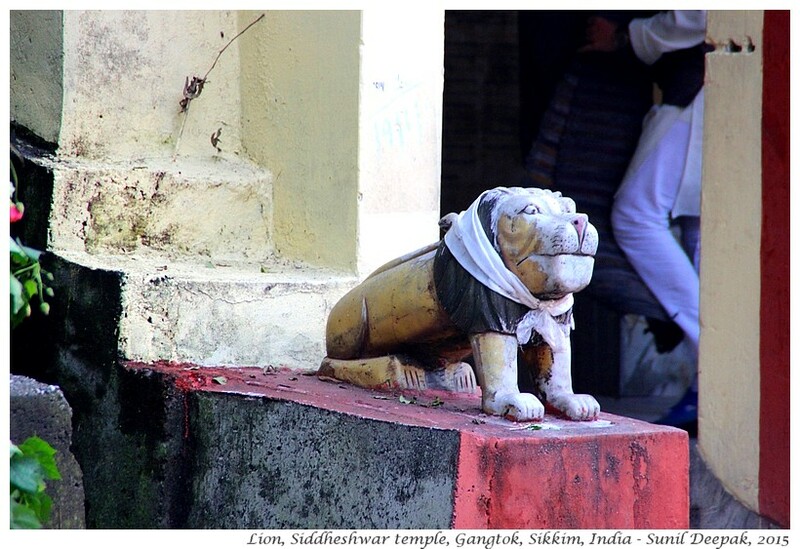 Outside the temple at the entry gate there are two cat-like lions with scarves around their heads. 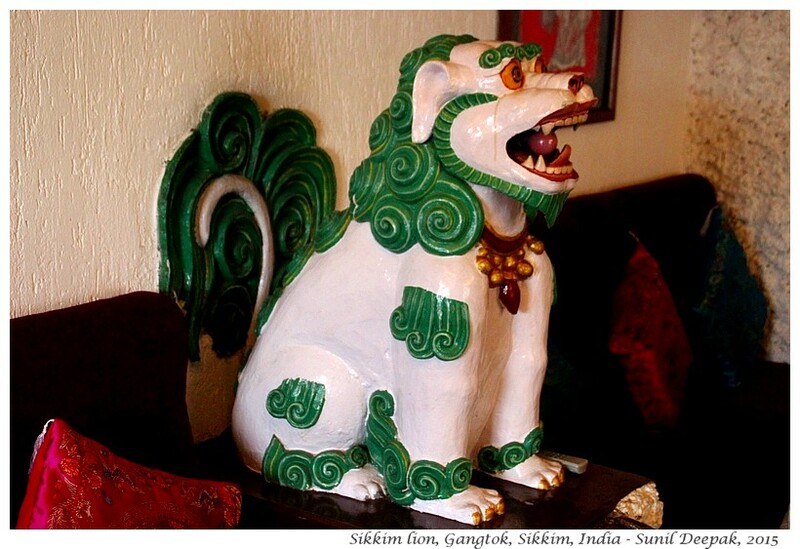 In Gangtok, you see often see lion statues, especially white lions with a green mane that are also part of Singha folk-dance and are the symbols of Sikkim (shown in the images below). As you continue your walk down the Pani House road, you will see the Sonam Palgye hotel on your left and a terrace overlooking the valley below on the right. Stairs from the terrace go down to the valley. I was told that coming up from the valley is a half-an-hour climb. If you are feeling adventurous, perhaps you can try this climb! From here you can also see the first part of the sky-lift of Gangtok connecting Deorali on Pani House road to the Assembly house above, near the city centre. 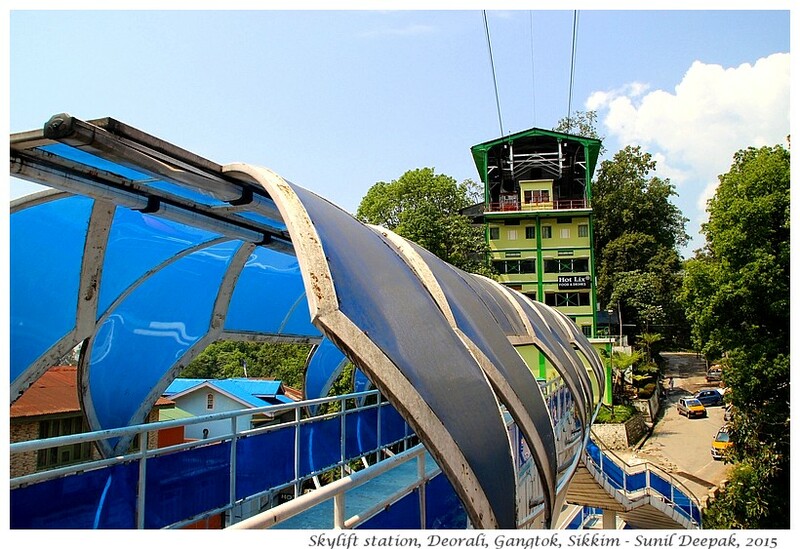 A brisk walk and 15 minutes later, you are at the Deorali sky-lift station. There is a nice over-bridge with a blue roof crossing the different roads and going to the sky-lift station. A ride in the sky-lift to the Assembly station costs Rs 80 per person (May 2015). When I had visited it, the second part of the sky-lift ride, connecting Assembly station to the Ridge/Secretariat above, was closed for repairs. However, if you are not tired, don’t go yet for the sky-lift ride, but rather continue down the road till you reach the Kubumlhakhang Buddhist temple on the right side. The temple is placed where the road makes a sharp curve and across the road you can see an old ceremonial gate called “Ganju Lama Dwar”. Beyond the gate, they have a military area. Visit this small temple, it is very beautiful. 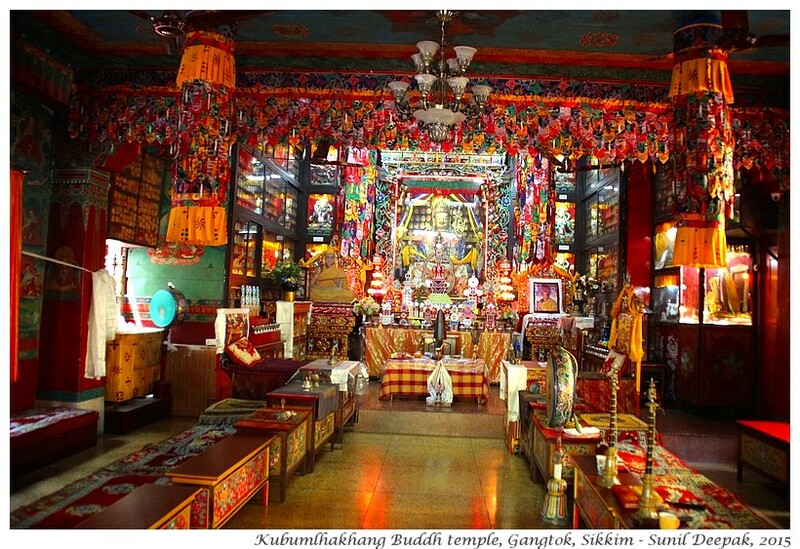 It is a beautifully decorated temple with a small monastery. 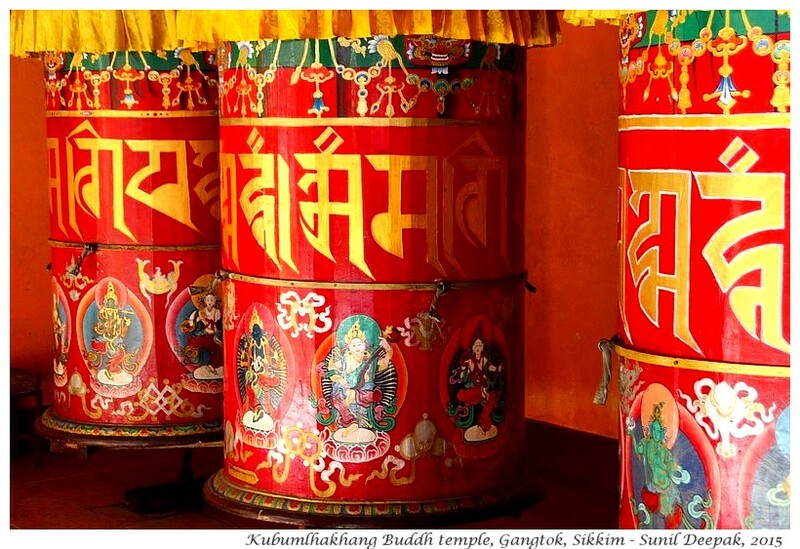 In an open space at its back, there are 3 antique giant prayer drums that are worth seeing. The red-coloured prayer drums seem to be made of wood. Probably once the Kubumlhakhang temple and its monastery had its entry from the Ganju Lama ceremonial gate across the road, that was cut-off when the road was made? After visiting the temple and the monastery, you can continue your walk down the Pani House road. 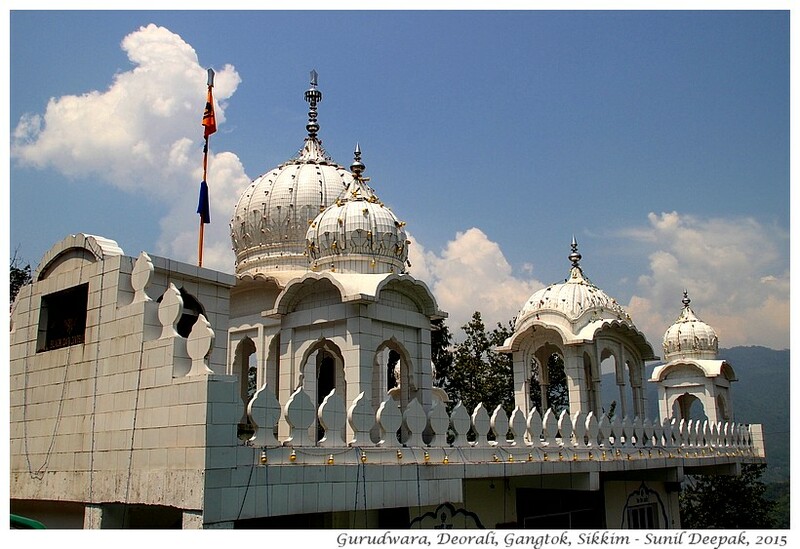 As you will follow the curve of the road, on the other side you will see the beautiful white Sikh temple “Gurudwara sahib” built by the Black Cat division of the Indian army. I did not go inside the Gurudwara as I was getting late for my appointment. Opposite the Gurudwara, just a few metres down on the right side is the Deorali Parking for the shared taxis for going back to Siliguri-New Jalpaiguri. Here ends this walking tour. From here you can walk back to the Deorali sky-lift station and take the lift to Assembly station from where it is a short walk to M. G. road. If you are not tired and do not wish to take the sky-lift, try a variation in your journey back to the city by taking the side road on the right just ahead of the Sonam hotel. There are less constructions on this road and there are lovely panoramic views on the northern part of Gangtok. This road will also lead you straight to M. G. road. I had an appointment at the Social Welfare department and had to go some kms further down to the 5th Mile, near the Manipal hospital. I made this part of the journey in a shared taxi. At the 5th Mile, they have a well-known Saraswati temple. I liked this temple for 2 reasons. 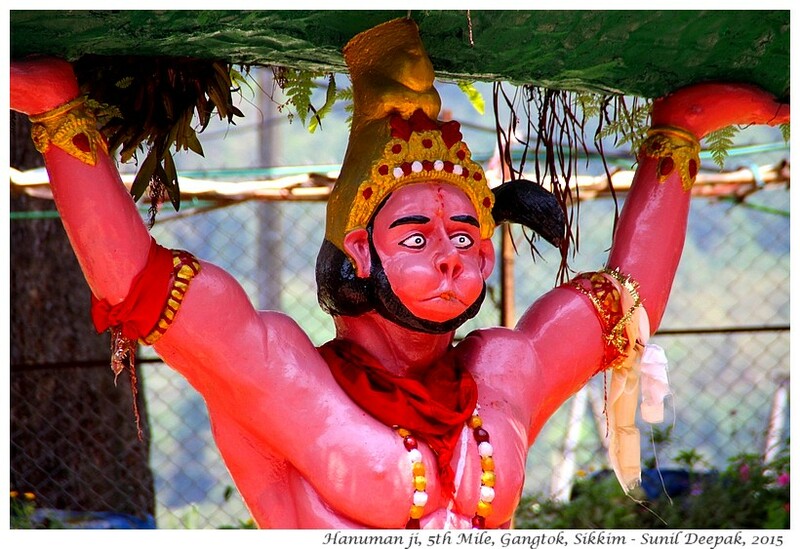 The first reason is a very colourful Hanuman statue in its park. 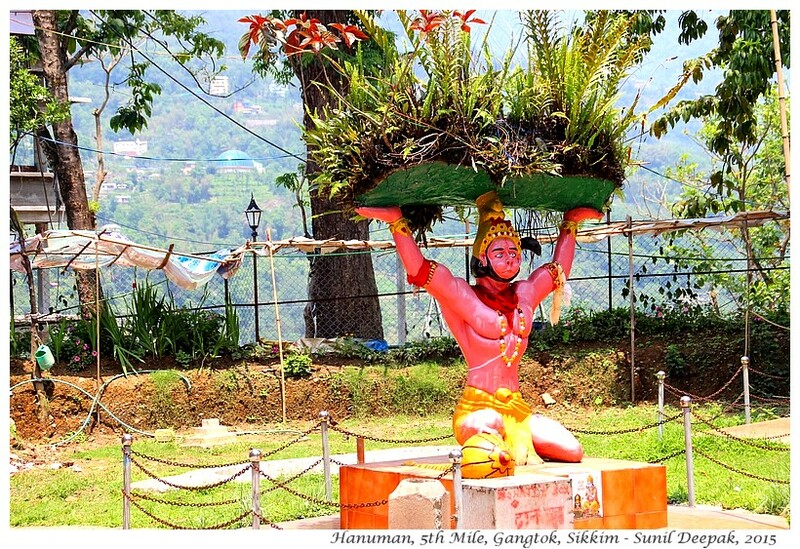 He is shown carrying the Chitrakoot mountain on his head with the herbs for treating Lakshaman who had been injured during the war with Ravan. 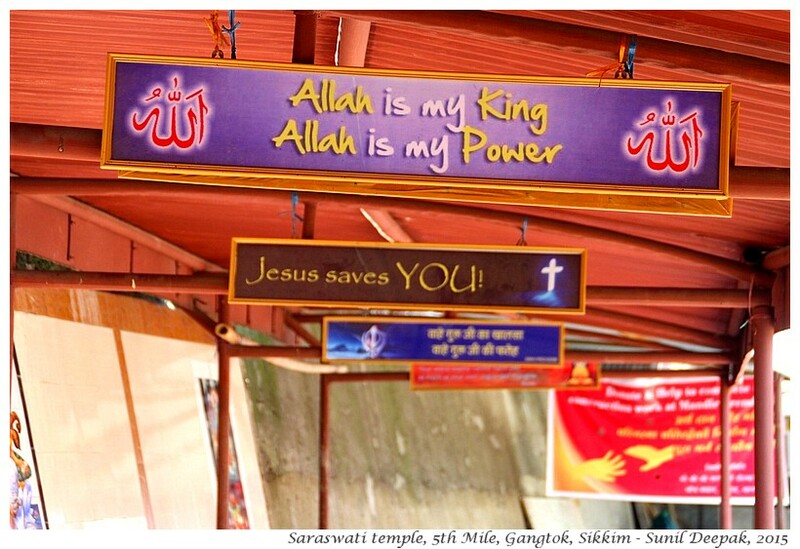 The second reason is that in the temple there are messages praising different religions including Islam, Christianity, Sikhism and Buddhism. Though our newspapers and news channels usually give prominence to fundamentalists, conservatives and fights between religions, majority of ordinary Indians are respectful towards different religions. 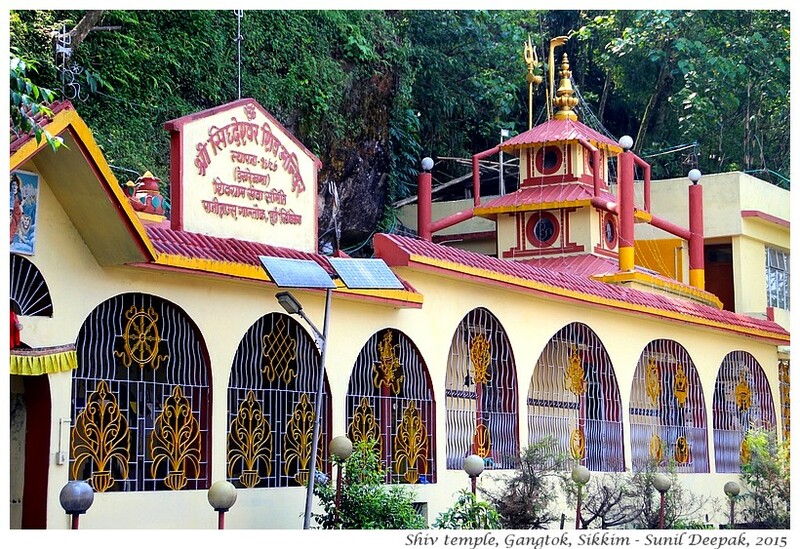 Often people also participate in the events and festivals of different religions.Thus, I think that it is appropriate that a Hindu temple dedicated to the goddess of learning (Saraswati) expresses respect for different religions and their teachings. 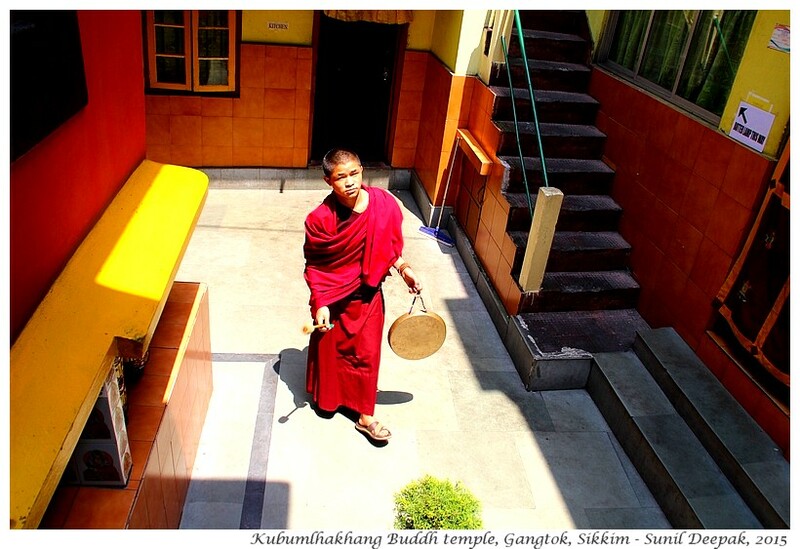 This second Gangtok walk is for discovering the little known places of Gangtok. Except for the Deorali sky-lift station, the places you can visit during this walk are not so famous for the tourists, but the Hindu, Buddhist and Sikh prayer places on this route are worth a visit. I want to close this post with another picture of Hanuman from the Saraswati temple. Every time I look at this picture, I am reminded of Salman Khan from the latest Bollywood hit “Bajrangi Bhaijaan”. What do you say, don’t they have similar expressions? pics are awesome and they are the soul of ur post & treat for our eyes. 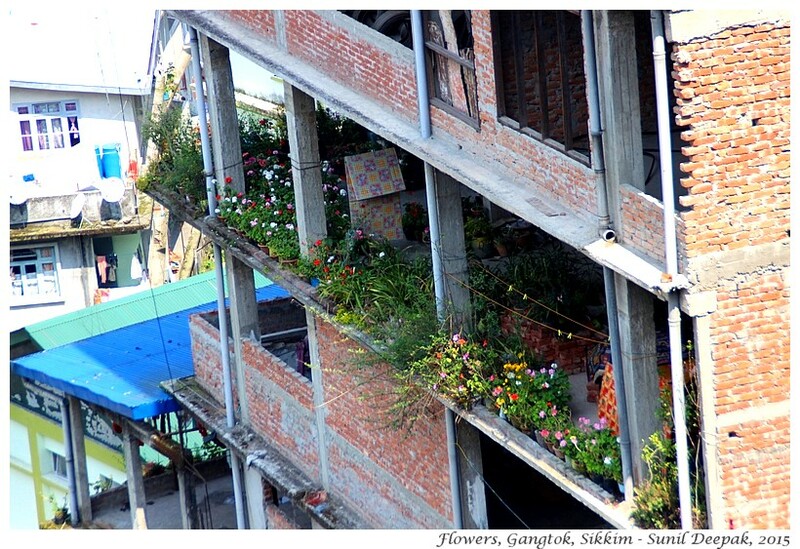 Glad to see the inside of gangtok, though wants to experience more.. Great work, indeed!!! Assam is indeed beautiful and Guwahati is home to incredible parks and beautiful temples. best places to visit in guwahati are awe inspiring and worth seeing.